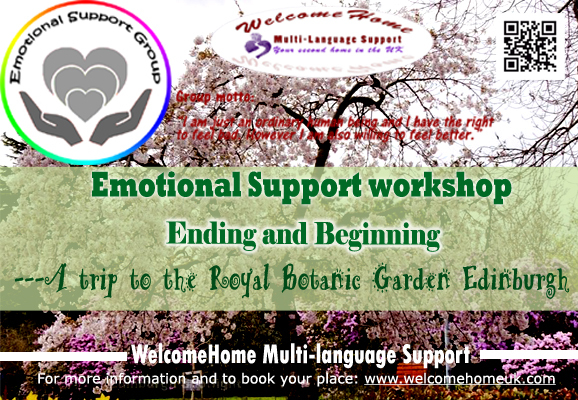 Learn how to effectively deal with life’s challenges and quickly rid yourself of emotional distress in our safe, warm and open minded peer suport workshop. It will help you deal with the loss of a relationship, pressure from study, work or anything annoying you. Note: The Peer Support Workshops are for Peer Support Group members only to ensure we can give a personal and tailored service. What is peer Support Group? Semester two is coming to an end and the summer is coming. Our peer support group will need to have a rest as well. 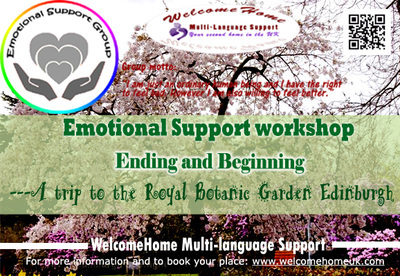 In the last session of the Peer Support Workshop, we will move to the Royal Botanic Garden Edinburgh. In the season of blooming blossom, lets say goodbye to our past and say hello to the future. Place: We will meet at the front door of the Royal Scottish Academy. Then we walk to the botanic garden together. --Please check our website for updated information. If the weather forecast changes we will move to somewhere indoors. As all the deadlines are approaching, do you feel your life is a messed, your mind is blocked, nervous, anxious, worried …it feels like it will never end and you can never make it? If so come and join us this week. 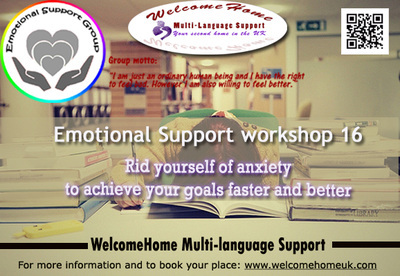 Workshop 16 will help you get rid of your anxiety and bad feelings to achieve your goals faster and better. Have you already started to worry about what to do after graduating? Where to go? Stay in the UK or go home? What to do? Study more? Find a job or start a business? Workshop 15 will provide a space for you to think about your future. Come and join us to share your ideas with others. Some people say attitude decides fate. What is attitude? Can we change it? 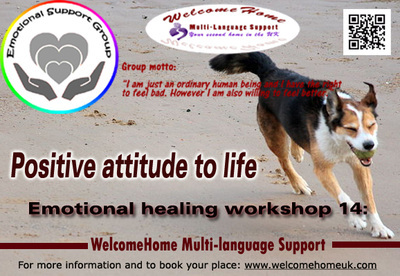 Come and join workshop 14 to discover your attitude to life. We will discuss how attitude is developed and how to keep a positive attitude, in order to help you to overcome obstacles. Why do we prefer to stay in our comfort zone rather then trying something new? Is there anything you wish to do but you are scared to try? 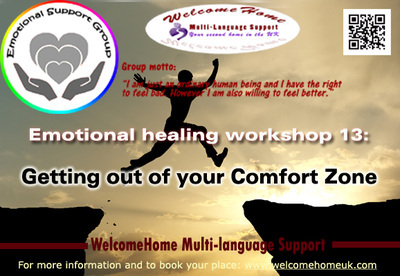 Workshop 13 is going to help you to step out of your comfort zone, as life begins at the edge of your comfort zone. “If I…” “should I…” We may regret missed chances. We may regret making mistakes in the past. Why do we feel regret about the past and keep hoping that we could change the things we regret? Why do we find difficult to let it go? 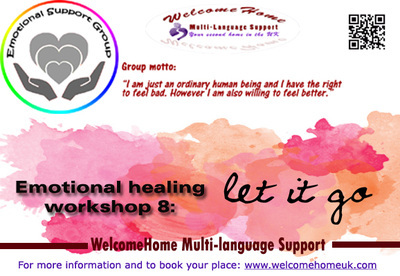 Workshop 8 will mainly talk about regret and how to find the way to let it go. Why sometimes when I achieve something successfully, I am still not happy and proud of myself? People usually want to do something to make others proud of them, such as their parents and friends. Have you done or achieved something that made you really proud of yourself, not just for others? 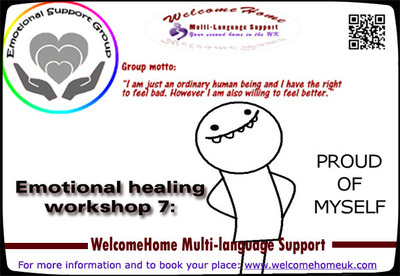 Don’t worry if you are not sure, workshop 7 is going to give you a platform to discover your internal world, your dreams and life goals. When talking about ourselves we all know our name, nationality, sexuality and age etc. This information can answer the question: who are we, which we call self-identify (Self-concept). However when we are asked: how are you ? Or how are you feeling now? Most people will only give an answer such as I am good, I am ok or I am not really good. People can only have a general feeling about themselves, which means we do not really understood ourselves or how are we feeling. Sometime people may feel totally opposite to how they answer. There are various kinds of feelings, such as anger, depression, anxiety, happy and love etc. So in the first session, let’s start from understanding ourselves and our feelings, as this is the key point to heal your bad feeling by recognising them first. 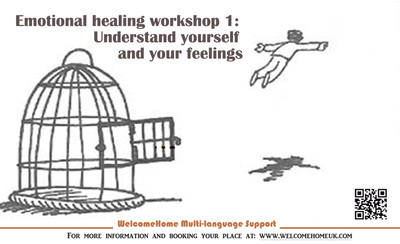 In this workshop we will help you to learn the way to define your feelings. 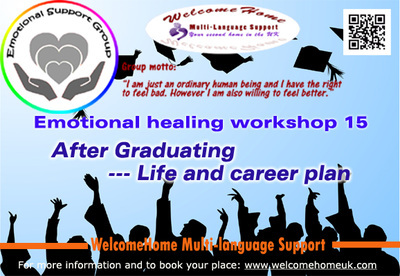 However as I said it is just a start, we will practice more in the other sessions to help you to be a master your feelings. In general people are all living a busy life. They always complain that they do not have enough time to take a rest. People always have a busy mind and do not take the time to really understand what they want and need, they may even find hard to make a decision for themselves. How can we listen to our heart? Workshop three is going to give you a peaceful environment for you to clear your mind. We will work together to transform our mind from negative and disturbed to peaceful. You are the only person that knows yourself deeply. Meditation gives you a chance to make a connection to your feelings, helps you to understand yourself more. Join us on Tuesday, lets focus and calm our mind. We always want to be happy. What is happiness? How to be happy? You may feel happy when you eat your favorite foods, when you are doing what you love, when you are spending time with people that you love. Does happiness come to us, or actually we can make ourselves feeling happy? There are several levels of happiness in our life. 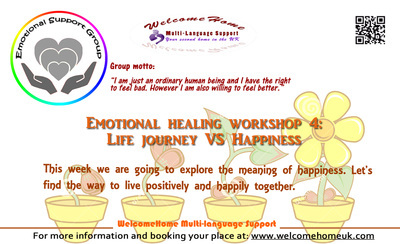 Workshop 4 is going to explore the meaning of happiness. Let’s find the way to live positively and happily together. Does personality determine our life? Sometimes our personalities affect how we behave and think. 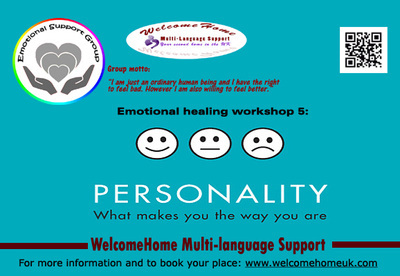 Come and join workshop five to explore your personality. Knowing your own personality helps you to understand who you are and make decisions more easily. Are you feeling lonely? Are there any skills to help cope with our loneliness? 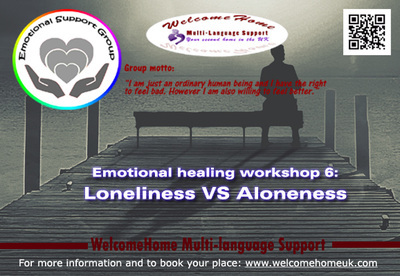 Workshop six is mainly going to deal with loneliness. Come and Join us, you are not alone. Let’s discover the reasons behind feeling lonely and overcome this negative feeling together.